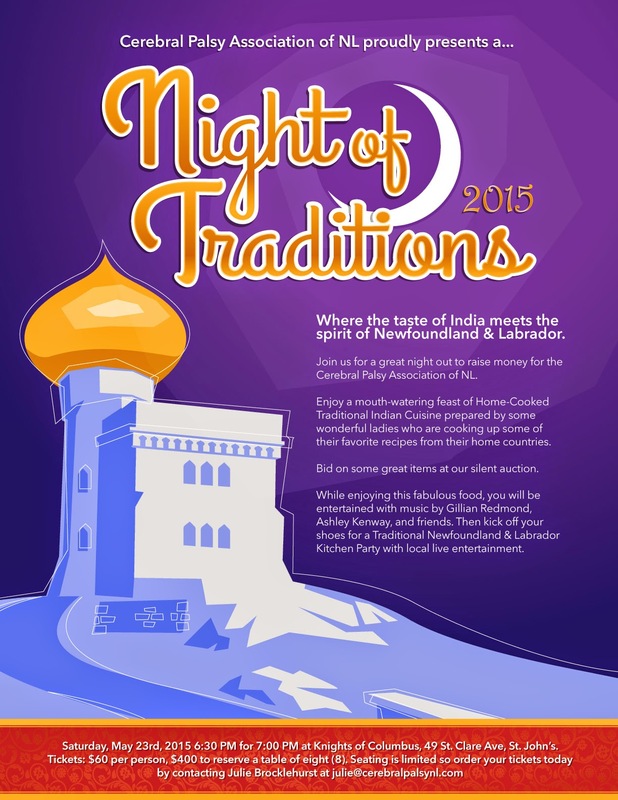 The Cerebral Palsy Association of Newfoundland and Labrador will be hosting it's second annual 'Night of Traditions' on Saturday, May 23rd. The event last year was a tremendous success, and we hope to make this year even bigger and better! Dr. Yasmeen Akhtar is a pediatrician at the Janeway Children's Health and Rehabilitation Centre here in St. John's. She sees children with cerebral palsy as they come through CP Clinic, and she knows the very real challenges that they face. She realizes the importance of an Association that is dedicated to improving the lives of individuals with cerebral palsy and their families, and she has offered, once again, to support our Association. Dr. Akhtar and members of the Women's Muslim Association have generously offered to prepare traditional dishes from their home countries. Indian delicacies like Butter Chicken, Tandoori Chicken, Vegetable Samosas, and popular naan bread will be presented among a buffet of diverse flavours and authentic Indian cuisine. After dinner, we will enjoy some live traditional Newfoundland entertainment, making it a true 'Night of Traditions'. It's going to be a great night, for an even greater cause. We would love for you to join us!